What is the objective of a ratings agency and a credit rating? How do credit agencies get paid and who are the main players in the space? Is there a difference in compensation ranges for the various agencies? Rating agencies provide credit ratings and independent opinions to indicate issuers’ creditworthiness to public investors. An issuer then use the rating to issue rated securities in order to raise capital. An issuer could be a corporation, financial institution, or government. The main players in the space are S&P, Moody’s, Fitch, and DBRS. 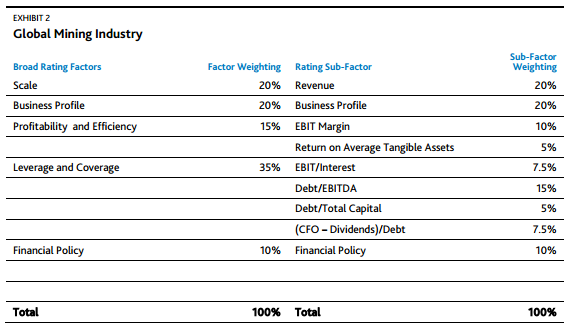 Each rating agency has its own methodology in assessing credit ratings. Although it is common to see one notch difference and/or split ratings between rating agencies, the general consensus on an issuer’s creditworthiness is fairly consistent. An issuer could obtain a public or private credit rating from more than one rating agency. Rating agencies generate revenue from issuer-pay model (issuer pays the rating agency to obtain a credit rating) and subscription model (subscribers pay a fee to access all rating reports). Larger and more established rating agencies also provide analytics, data, and credit modeling platform subscription (i.e. S&P Capital IQ and Moody’s Analytics). 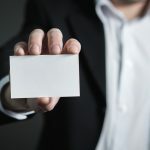 Since there were critics with the issuer-pay model, there is a Chinese wall between the salesperson and the analyst to mitigate the potential conflicts of interest. Issuers to communicate their creditworthiness and the credit quality of their debt issue to the public in order to expand the universe of investors. Businesses and financial institutions to assess counterparty risk. What sort of debt is rated and how can credit ratings differ among different tranches of debt for an organization? Credit ratings are assigned to issuers, debt securities, and bank loans. Credit rating at the issuer level indicates the entity’s ability to fulfill its financial obligations, while credit rating at the debt issuance level indicates the credit quality of the specific debt issuance depending on the terms and conditions, legal structure, seniority, priority of repayment, external support, and credit enhancements. Speculative Grade / Non-Investment Grade (BB+/Ba1 and below). Speculative Grade issuers have the ability to repay but face significant uncertainties. Generally speaking, corporate credit ratings at the Investment Grade level tend to be much more stable than Speculative Grade level. For example, a Speculative Grade issuer’s credit rating can change from B+ to BB- much more frequently than an issuer with a BBB rating. Therefore, a default risk based on what can be recovered is emphasized when rating at the debt-issue level. Default scenario modeling is not performed on issuers with Investment Grade corporate credit rating. Rather the debt is judged based on ranking to identify material disadvantage for a given tranche by virtue of the existence of better-positioned obligations. For example, debt with relatively good recovery prospects (i.e. well-secured debt) can be notched above the corporate credit rating, but debt with relatively poor prospect (i.e. junior debt) can be notched below the corporate credit rating. However, issuers with Speculative Grade corporate credit rating will have each debt issuance rated using a full blown default scenario. A Recovery Rating is issued at each tranche and notching up/down from corporate credit rating will depend on the percentage recovery expectation that debt investors would receive at the end of bankruptcy proceeding. What teams exist in major rating agencies (different industry corporates, financials, governments and supranationals etc.)? How do they differ in analysis and clientele? There is one common general criteria, adjustments, and methodology as a basis, then there is sector specific criteria that go in more details. What candidates do rating agencies look for in terms of education and certifications? Master of Finance degrees, CFA, and CPA are highly recommended. Rating agencies are also interested in hiring candidates with engineering background for specific sectors, such as Metals & Mining, Power & Utilities, and Oil & Gas. What technical knowledge would you expect from a new hire? What credit questions would you ask? We expect them to be able to analyze financial statements and have some kind of credit analysis background. We usually provide a case study for them to complete before coming in for an interview. During the interview, we will ask questions about their write-up and rationale for the rating. We also ask whether they understand the difference between operating lease vs. capital lease, debt adjustments, EBITDA adjustments, pension, ARO, capital structure items (preferred shares, convertible debt), etc. The credit questions are similar to CFA Level II Financial Statement module. What credit analysis is generally performed on a corporate? What are some limitations to credit analysis? A credit analysis is generally performed after meeting with the company’s management. The primary analyst will then present his/her recommended rating to the Rating Committee consisting of a chairperson, voting members (i.e. senior analysts and industry specialists), and other non-voting members (i.e. junior analysts). The role of the rating committee is to review and assess the analyst’s recommendation and to provide additional perspectives and checks and balances on the criteria. This is also to limit the influence any single person has on any rating. Credit committee is a great training ground for junior analysts. After the voting, the issuer is notified of the rating committee’s decision and the rating is officially communicated to the public (for public ratings) or a private report will be issued to the issuer (for private rating). Ongoing surveillance will also be conducted as appropriate. Limitation on this method is that (a) there may be a tendency on groupthink bias during the rating committee and (b) a recommended rating opinion on the qualitative aspect may vary depending on the primary analyst’s judgement. S&P’s corporate criteria framework methodology is oriented more towards qualitative basis, in my opinion. The anchor rating provides an initial rating that could be further notched up or down using Modifiers based on the primary analyst’s judgement. Anchor rating is a preliminary rating based on Business Risk Profile and Financial Risk Profile matrix. Business Risk Profile (Excellent, Strong, Satisfactory, Fair, Weak, and Vulnerable) is determined after considering the final scores on Country Risk, Industry Risk, and Competitive Position. Competitive Position is based on specific sector criteria that determine the weighted average score for three categories: (1) competitive advantage, (2) scale, scope, and diversity, and (3) operating efficiency. The analyst must use judgement based on the criteria description when determining the corporate’s competitive position relative to peers. Financial Risk Profile (Minimal, Modest, Intermediate, Significant, Aggressive, and Highly Leverage) is determined by quantitative analysis from the financial modeling, which generally weights 75% for the next three years and 25% historical two years. 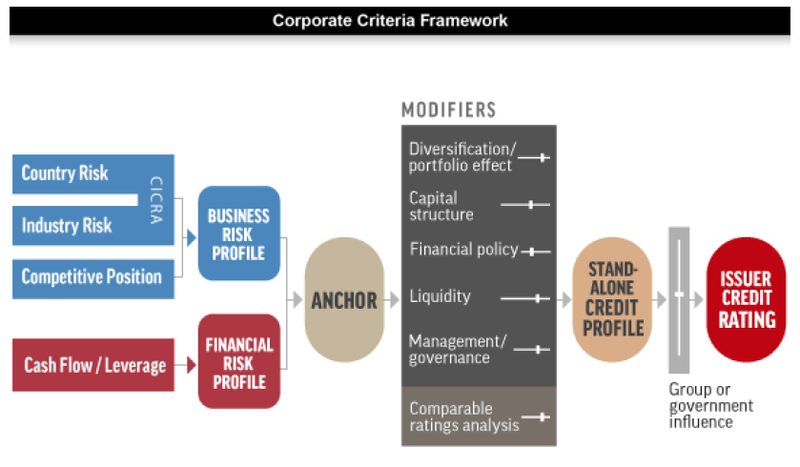 The analyst can use Modifiers and Group/Government Support to notch the anchor rating up or down in order to recommend the Issuer Credit Rating. The primary analyst will then present the recommended Issuer Credit Rating to the credit committee. Moody’s grid factors methodology is oriented more towards quantitative basis, in my opinion. The number of factors and weight vary depending on each sector criteria. For example: global mining sector puts more weight on leverage and coverage factor vs. pharmaceutical sector puts more weight on the business profile factor. The grid provides an Indicated Rating by scoring the factors based on the 12-18 months forward view. The primary analyst could further modify the Indicated Rating using qualitative factors that are not captured in the scorecard to recommend the Actual Rating Assigned to the credit committee. Scale – revenue size assessment. Business Profile – competitive position assessment. Financial Policy – perceived tolerance of a company’s board and management for financial risk and the future direction for the company’s capital structure. When will agencies have conversations with customers and what is discussed? Rating agencies have management meetings regularly (at least once a year) to get an annual update on the issuer’s performance. During the meeting, they discuss business strategy, financial policy, and new developments that may change the credit risk profile. The frequency and extent of meetings depend on the issuer’s specific risk considerations, industry, changes in the business climate or credit markets, new technology or competition, regulatory changes, changes in capital structure, etc. Since credit ratings are forward-looking, analysts and management also discuss non-public information that is baked into the rating, but not disclosed in the publications until it becomes non-MNPI. What is the career trajectory? (Analyst manager senior manager VP assistant treasurer treasurer CFO) and how many years for each jump? Recently ratings agencies have reorganized its structure to be leaner. It used to be top heavy as many senior analysts tend to stay within the company long-term (25+ years). Career trajectory is generally: Research Assistant (starting $55k + bonus) > Ratings Analyst > Associate > Associate Director > Director > Senior Director > Managing Director. What are some trends in the rating agencies space and the industry? Was confidence hit after the credit crisis? Credit analysis work becomes more automated to cut costs. Greater transparency to the public on the rating methodologies was required after the 2007 subprime mortgage crisis. Both Moody’s and S&P reviewed and updated their rating methodologies afterwards. What sort of work comes up regularly throughout the year (as opposed to what’s your average workday like)? Other than regular reviews, additional work may come regularly from credit surveillance, such as research updates, industry-related publications, and event-driven reviews. Event-driven reviews are conducted during potential M&A transaction, debt issuance, changes in the industry outlook, Rating Evaluation Scenario (“RES”), etc. Senior analysts will also do conferences, webcasts, interviews, and podcasts as part of investor outreach. What are the hours like and are they flexible. The hours are reasonable and work-life balance is very good. It’s usually 9 – 5 weekdays only. Some agencies allow further flexibility where employees can work from home. The more senior you become, the more flexible the hours can be. Ratings agencies provide a very valuable training ground in credit analysis and financial modeling. Work experience tend to be the most rewarding at the junior level since the credit analysis training is a lot more intensive and in-depth than other financial institutions. Hence, the turnover at the junior level tends to be high as they often get poached by the buy-side, banks, and issuers themselves. Most of the time, rating agency analysts quit to go to the buy side. Yes, but referrals are highly recommended. When investment banks provide ratings advisory, do they speak with agencies for guidance? Rating agencies are not allowed to provide consultation or recommendation. Investment bank’s rating advisory can only ask for clarification on the criteria or report and then come up with his/her own recommendation on which direction the rating agency’s opinion may be headed. Rating agencies, however, can provide scenario ratings called Rating Evaluation Service (“RES”). Investment banks can provide hypothetical scenarios and the Rating Agency can provide a confidential opinion based on each scenario presented.